A delightful extremely well equipped, cosy three bedroom cottage within easy walking distance of all village facilities. Recently updated kitchen and bathroom, new doors and windows 2009. The cottage is located in a quiet cul-de-sac with private gardens. Open fire/Satellite TV and free Wi-Fi. 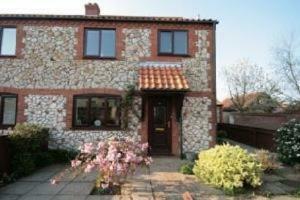 Within easy walking distance of all village facilities including shop and excellent restaurants. RSPB Titchwell is half a mile from the cottage and within easy walking distance. Full details of the cottage and facilities are given with each booking. All linen and towels provided except beach towels. Free wi-fi internet access.Free Sat TV system.. Children welcome from any age. Taking the main A149 through Thornham and going towards Titchwell one takes the last left hand turn in the village down Green Lane. Malthouse Court is a turning left just after entering Green Lane. From King's Lynn - 20 miles.